I started out the day in tears. Lots of tears. A dog died this past weekend, and he was a very special dog to me and many others. His name was Rukkus. I met him and his mom Mindy several years ago when my sweet Georgia was first diagnosed with cancer. Mindy is one of the many friends I have made through the Pet Cancer Support group – people who listened to my fears, cheered me and Georgia on at every turn, picked me up on the darkest days, and who have been there for me time and time again over the years, even though I’ve never actually met one of them in person. Distance has never interfered with the strong bond we all share thanks to our furkids. Rukkus is one of the dogs who has been my guiding inspiration over the years – both when Georgia was fighting and now that I carry on her legacy by helping other families dealing with this disease. I always point to his story as an example of how a pup can defy the odds and become a true cancer survivor. He was first diagnosed with cancer at 3 years old, in 2001. And he fought a different type of cancer a few years later. He ended being a 4-time cancer survivor, despite being given less than 3 months to live on Valentine’s Day 2005. He just kept fighting, and kept winning. He seemed unstoppable. But in the end, Rukkus had to go to the Rainbow Bridge. It was his time I guess. He was in a new battle against lung cancer, which had come on suddenly and aggressively. But he was also getting older. He had seen many birthday parties, gamely wearing a party hat for photo ops and just to make people smile. He had shared lots of cuddles with his family, chased many bunnies in the yard, and given a few veterinary professionals in Ohio more than a couple of grey hairs I suspect, with his legendary shenanigans during his many vet visits over the years. (Rukkus was NOT a fan of going to the vet!) But he also gave so much hope to me and countless others just starting this journey with cancer. And today, I mourn for this boy who has been part of my heart for so long. And I cry for my friend who I know is hurting today after fighting so hard and so long for her beloved Rukkus. Her funny, sweet and one-of-a-kind “Butthead Boy”. But through my tears today, I’m also reminded of advice I give almost every week as I talk with pet parents dealing with the pain of loss – that grief is not linear. There are many setbacks along the way and your grief can be triggered when you least expect it. It’s normal. It’s just part of the process. And today I realize that this is true even years later (my apologies to those who think that pet loss can magically disappear after just days or weeks). The hurt from my own loss is still close enough to the surface to break through I guess. And the loss of Rukkus feels devastating to me today. In my head, I know that this surge of grief is because he was one of my last true connections to Georgia. 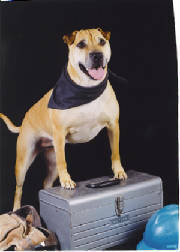 Over the years, most of the other pups who bravely fought alongside her have already gone to the Bridge. But Rukkus persevered. It was as though he would live forever — continuing to fight on behalf of all of us, when our own babies could no longer go on. His success was our success and as long as he was still here, time could stand still in a way. I could keep believing that Georgia was here with me just yesterday. It hasn’t really been nearly 5 years since she left me. How could that be when our friend Rukkus is still going strong? But, all angels have to fly back to heaven eventually. And though his halo may have been a little crooked at times, Rukkus was undoubtedly an angel here on earth. But, today isn’t about me, or my lingering grief. Although my pain is real, it’s totally beside the point. Because today is about celebrating the life of an amazing, unique and wonderfully-loved boy named Rukkus. A hero who bravely battled cancer for TEN YEARS! A boy who has given hope to so many and who will never, ever be forgotten by those who knew him, and those of us who had the privilege of seeing him through the loving eyes of his mom, and best friend, Mindy. Rest in peace my dear friend. May you find wonderful fields to run in, lots of warm sunshine, and the love of many new friends at the Bridge. Godspeed Rukkus. You will be forever loved and missed. This entry was posted in News, Pet Loss / Grief and tagged canine cancer, canine lung cancer, dog cancer, mast cell cancer, pet loss, rukkus, sebaceous gland carcinoma. Bookmark the permalink. Rest in Peace beautiful boy! My heartfelt condolences to Mindy. Kerry, what a beautiful tribute. Whenever I read about another canine child losing their battle, it stirs up memories of the courageous fight my precious Brandon lost against hemangiosarcoma in August 2009. They will always have a special place in our hearts! How sad that dogs have to experience the same illnesses that people have. They don’t understand what is happening to them. My heartfelt condolences to you and your sweet dog. My wonderful dog Sadie had lung cancer and lost her battle at age 12.5. I hope the good memories of your time together will ease your pain. Rest in peace sweet Rukkus. For all of us that have lost cherished furry, family members, we mourn with you. I’m so glad you had Rukkus with you as long as you did. Our little guy, Simba succumbed to lymphoma 3 days before he turned 7. Everytime I read of another precious canine losing the battle to cancer, I know and feel your pain. I turly believe we will be reunited with our special ones one day. My deepest sympathy goes out to you. My heart goes out to you Mindy. So Sorry for your loss. You were the right person to care for Rukkus in his Battle. You also had a wonderful Hubsand helping you. RIP Rukkus and god speed on angel wings. My deepest sympathy to your furry loving mom. I know the pain she is feeling and it reminds me how much i miss my Koda Bear after she lost her fight. But i know they’re over the rainbow bridge running, barking, playing, and soaking up the sunshine. At peace and outta pain forever. And i know someday i’ll see her and my other fur babies again.